This is the second visit to the Island in two weeks, Majorca is still a popular destination with manufacturers to launch their new cars. It is easy to get to from most places in Europe, the roads are good, and there’s a plentiful supply of hotels, especially out of season. 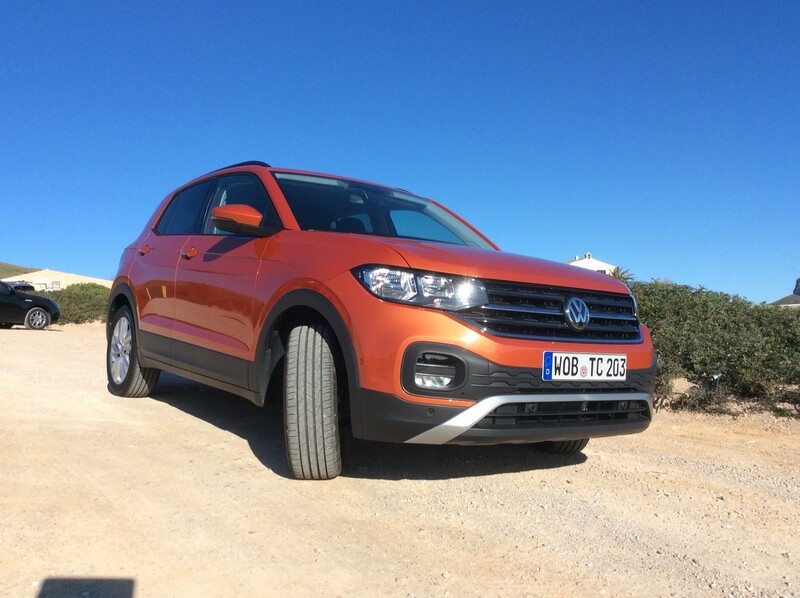 The T-Cross is Volkswagens first ever compact SUV, to put it into context, and how it fits in the model line-up, it measures 4,107mm and a height of 1,558mm. This compares to the Polo at 4,053mm long and 1,461mm tall. The T-Cross’s big brother, the T-Roc is 4,234mm and 1,573mm high. So, the T-Cross fits nicely in between the two. Only one engine will be available in the UK at launch, a 1.0-litre, 3-cylinder petrol, with the option of two power outputs: 95ps or 115ps. 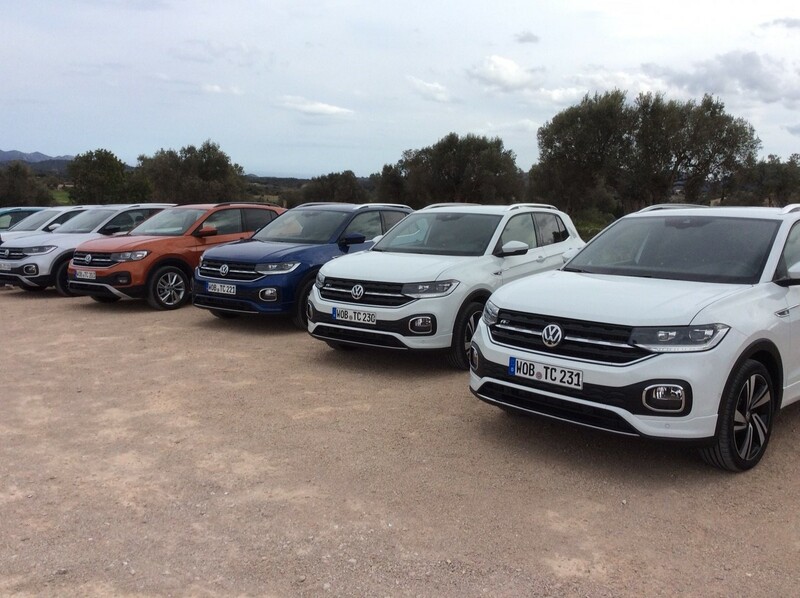 The cars were all neatly lined up outside the airport in the sunshine and ready to go… the first we drove was the higher powered 1.0-litre 115ps, coupled to a 7-speed DSG auto gearbox, a very nice combination. We set off from Palma, and almost immediately thought what a great little car this was, we could almost have got back on the plane an hour later, firmly believing we had driven it enough to know just how good it was. But we drove around two-hours in a northerly direction towards the hotel on the north-east side of the Island. A great journey, with great roads, and even better scenery, and places most people who visit Majorca never see, or know about, go inland and it really is spectacular. The 115ps engine was well within its comfort zone, and had more than enough power for all the road conditions we went on: dual carriageways, where it happily cruised at 130kph, up in the hills, and through the pretty little villages. For a small car, measuring around 4.1m, it certainly has plenty of leg, shoulder and headroom. The boot is more than adequate and with the rear seat up can carry 455-litres, and fold them down and it increases to 1,281-litres. It also has the advantage of a sliding rear seat can be moved back-and -forth by 14cm, allowing either more leg room, or more boot space. Initially all T-Cross sold in the UK will be petrol powered, and all will be Front-wheel drive. 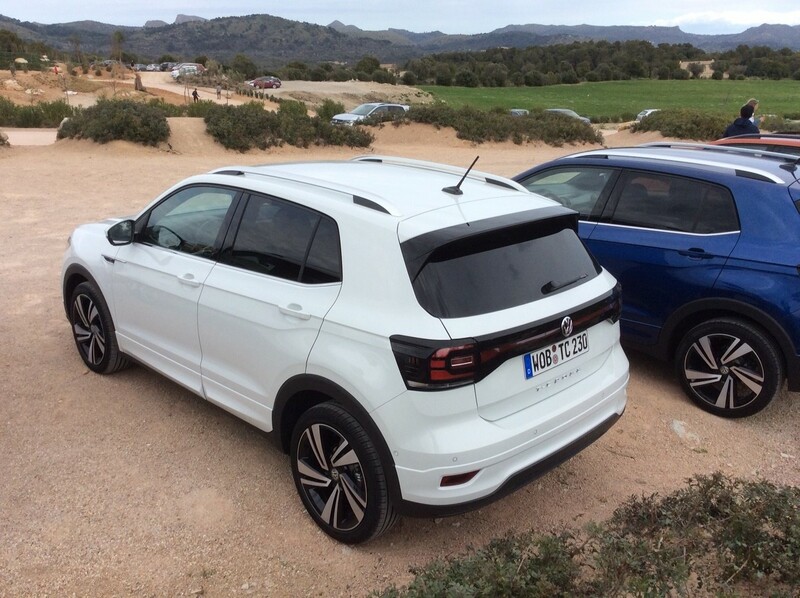 In Majorca, there were some 1.6TDI there to test, but I guess that this engine will not come to the UK, based on current demand for diesel powered cars, we did not drive the TDI as we thought given the circumstances, it was pretty pointless. On these International events, they normally last a couple of weeks, with many rotations of countries, who fly in one day, stay overnight, and back home the next. On our two days, there was the UK, joined by Japan, South Africa and Slovakia, so a mixed bunch, but all very friendly, especially those from Johannesburg, and surrounding area, great fun people. 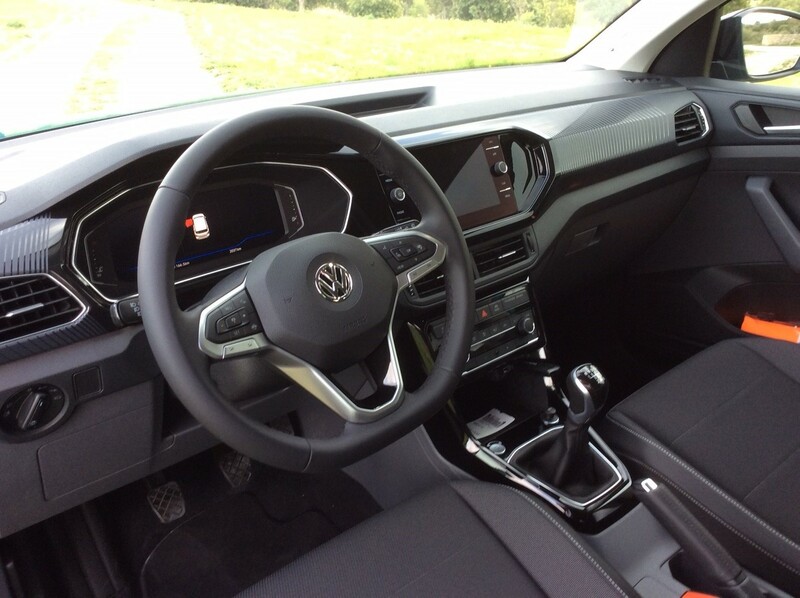 The one and only complaint about the T-Cross was the fact that when the rear seat was in the rear-most position, and it was then folded down, there was no gap between the rear floor and the seat. But slide the seat forward, and a gap appeared, and quite a large gap too. So I suppose if you don’t want to lose anything under the floor, you need to remember to slide the seat back, before you put the rear seat down. The exterior design is great, with some fantastic lines, not only the styling, but also the clever engineering and metal pressing, the lines are crisp, sharp and really make the car look superb. After a bit of lunch, we got into a 115ps 6-speed manual, and we really liked this combination also, and this is likely to be the best seller. It is priced around £700 more than the 95ps, and you do get that extra bit of power, but also an extra gear too. The evening was spent with our old friends from the UK, and our new friends from other parts of the world, and we discussed worldly issues, especially the motor industry, that seems to be struggling everywhere. The second day, and it was the journey back to Palma airport. We managed to secure a 95ps T-Cross, as these did seem to be in demand. We did think it would feel underpowered compared to the 115ps, but it didn’t really feel much different, it really was very good, and enough power for the type of driving we were doing, which is probably the sort of motoring most people do in this type of SUV. Having a 5-speed manual wasn’t really an issue, as the top gear was fairly high, and it did not feel as though the engine was screaming its head off, high-ish speeds at fairly low Revs. Prices in the UK for the T-Cross start from £16,995.